Abram Dunn Gillette was a Baptist pastor. He was born September 8th, 1807, at Cambridge, Washington County, New York, the son of Dr. Fidelio Buckingham Gillette and Tabitha Dunham. Dr. Fidelio Buckingham Gillette was the son of Rev. Elisha Gillette. Tabitha's great grandfather, Rev. Edmond Dunham was one of the "founding fathers" of the Seventh Day Baptist denomination in America. Cambridge, Washington County, New York, was a homesite of other of Fidelio Buckingham Gillette's relatives as well. A.D.G. 's brothers and sisters were Cornelia (died at age 21 in 1813), Philander D. Gillette (not to be confused with another relative named Philander D. Gillette), Emmiline, Eunice, Fidelio Buckingham Gillette (named after his father), Sarah, Walter, Daniel Holbrook Gillette, another Cornelia (named probably for the one deceased), Elisha (born July 12 1820, died January 17 1821), and Abigail Gillette. Abram Dunn Gillette was educated at Granville Academy at Granville, Washington County, New York, and attended the Baptist church there, where Samuel C. Dillaway was Pastor. He entered the ministry in 1832, and pastored in Schenectady, Philadelphia, New York, and Washington, D.C.
July 1, 1835, Abram was married at New York City by Rev. William Parkinson, to Hannah Jenkins. Her mother, Susannah Jenkins' lineage extended back to ancient Scottish peerage in the eleventh century, to William Sinclair (or St Clair or Santo Claro), Earl of Caithness. Abram and Hannah eventually moved to Philadelphia, where Abram pastored a prominent Baptist church, Eleventh Baptist Church. All their children were born in Philadelphia between 1836 and 1849, Susan, James, Walter, Daniel Gano Gillette, William Post Gillette, and Grace. Considering the fact that ADG's Pastor back in New York, Samuel C. DiIlaway, was a life member of the American Baptist Missionary Union, it is likely we may find that ADG was also a member of that body. We do know that he was a member of the Philadelphia Baptist Association, and headed the American Baptist publication society from 1836 to 1848. He wrote the "History & Minutes of the Philadelphia Baptist Association from A. D. 1707, to A. D. 1807; being the first One Hundred Years of its Existence. Edited by A. D. Gillette, A.M., Pastor of the Eleventh Baptist Church, Philadelphia. Philadelphia, 1851." He also wrote "A Sketch of the Labors, Sufferings and Death of Adoniram Judson. Philadelphia, 1851," and the "History of the Eleventh Baptist Church, Philadelphia," one titled "Pastor's Last Gift," another titled "Social Hymns," and a work titled "Memoir of the Reverend Daniel H. Gillette." On this last-mentioned party the webmaster only knows that when the Baptist Church of Sherburne in the Town of Sherburne, Chenango County, New York was first incorporated as the Sherburne Village Baptist Society, Rev. Daniel H. Gillette served as its Pastor, from March 31, 1838 to May 19, 1839. Abram Dunn Gillette's ministerial work eventually took him from Philadelphia, to Washington D.C.. He was residing there at least as early as 1863. In 2003 Mary Pawlowski sent us the following information: "Dr. Gillette was the fourth pastor of The First Baptist Church of the City of Washington, DC., from 1863-1869. The church has a portrait of him and a printed copy of at least one of his sermons." As a Christian Pastor, ADG was sometimes called upon to visit the condemned in prison. We find him ministering in that capacity in 1865, to those who were tried and executued for involvement in the plot to assassinate Abraham Lincoln. The conspirators were Lewis Thornton Powell alias "Lewis Paine" or "Payne"; David Edgar Herold; Michael O'Laughlen; John H. Surratt, Jr.; Edman Spangler; Samuel Arnold; George Andrew Atzerodt; John Wilkes Booth and Mrs. Mary E. Surratt. According to the recollections of Dr. Abram Dunn Gillette who was the minister called in for Powell in his death row cell and on the gallows, the youth did not partake of breakfast on the morning of the execution. ADG took an interest in the genealogy of his family, put in writing some of what he already knew in 1867, and even undertook to travel to some specific towns and cemeteries in attempts to fill in the gaps where he was lacking information. He put the information in a document he titled "FAMILY AND ANCESTRAL RECORD, made by Abram D. Gillette D.D. at Washington D.C. this 21st day of March, 1867." It was typewritten on 8 sheets of paper 12 inches long, clasped on one end, and folded into a folio. He appears to have made and distributed mimeographs of his "FAMILY AND ANCESTRAL RECORD" to family, and this document circulated. Today individual Gillettes "out there" are occasionally found who have received either verbally or in some written form or another pieces of information that are obviously direct quotes from ADG's "FAMILY AND ANCESTRAL RECORD" although the present day invididual never knew of that document's existence. They only have a "tidbit" or two passed on, from, say, their grandfather. But it becomes clear by looking at the presently circulating information, that the info in ADG's document did indeed circulate. A very few fortunate individuals own one of the mimeographs of the document that circulated back in the 1800s. The webmaster of this site once owned one of them. It disappeared off of a table in a genealogical library where he was doing research. Fortunately, he still has a complete photocopy of one of the early mimeographs. While ADG's "FAMILY AND ANCESTRAL RECORD" is immensely helpful in doing research on that particular branch of Gillettes, and it contains a great deal of accurate information, it is the belief of the webmaster (yours truly) that ADG was wrong on a couple of historical points and incorrect on one or two dates for individuals, etc. None the less, his document remains an invaluable contribution to genealogical research on that family. Declining health led to him retiring from ministry in 1869. One source says that he died August 24th, 1882 at Lake George, New York. 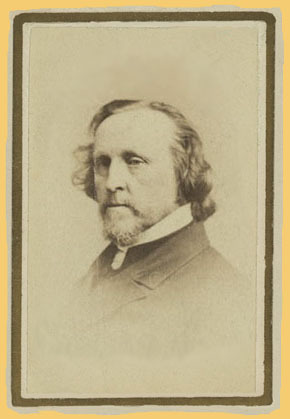 One source thought it to be at Washington, D.C.
A book about him was edited by four of his colleagues, and was published in 1883 by Daniel Gano Gillette, ADG's son. It was titled "REMINISCENCES of THE LIFE AND LABOR OF A. D. GILLETTE, D.D." and a memorial window was placed in Calvary Baptist Church, New York, in 1887, in his memory.